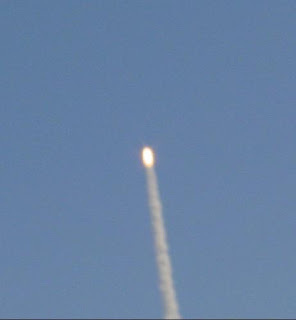 I almost drove to Titusville yesterday to see the space shuttle launch. I have never been that close and usually settle for going out in the yard. I have determined that the next time it goes up, that I am going to go. I tried a couple of years ago, but it got scrubbed and I had to turn around and come home, having wasted a half a day. But it is something that we should see as central Floridians. It would almost be a crime not to. Gabe's son Ethan was over and it was fun to show him the real Buzz Lightyear. I wonder if the real thing lived up to his expectations? On that note, we will be talking about expectations in church tomorrow. I expect you to be there! Here is something from the devotional blog that I wanted to share with everyone. The imagination is a powerful thing. A children we would spend hours playing in the pretend world of our imagination. Life however has a way of exchanging our imagination for reality. In fact it is very hard for us as adults to imagine very much at all. I read this quote in a commentary on Ephesians this week, and it struck me so much that I had to go and make Amy read it. "I read of the rockets and the probes into outer space. I read concerning man's braggadocio declaration that he will go to the moon, and that he will use the moon as a springboard to reach Mars! And then I remember that every major judgment God has sent upon this earth was preceded by the desire of God's creatures to by-pass God and become gods themselves." It is hard to believe that in 1963 that space travel as we know it was thought to be "braggadocio" that going to the moon or to Mars was thought to be an attempt to "by-pass" God. I though about this last night as I stood in the front yard with my family and my neighbors and watched the space shuttle Atlantis blast into orbit. Wow! Somebody imagined that, when others were saying things like this guy, who by the way will go nameless. I only bring this up to make the point that we as believers can easily kill the very imagination that God has given us. God does not want us to live in this human reality, God wants us to live in His reality. And His reality appears to be a lot more fun, a lot safer, and the only true reality. I don't know about you, but I am going to spend some time today imagining what God can do through me, and what God can do through Cornerstone. Then I am going to talk to Him about it and then go read this verse again and know that He is able to do immeasurably more than I can even imagine.